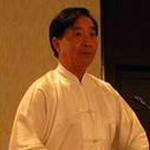 Our teacher, Master Zhu Tian Cai is the 19th disciple of Chen Style Taijiquan from Chenjiagou (Chen village). This is where Taijiquan first originated, and gave birth to the many styles of Taiji we see today, such as the Yang, Wu and so on. The village is well known for its unique brand of martial arts, which later became known as Taijiquan — Chen Style Taijiquan. And almost everyone, young and old, in the village knows Taiji – Chen style of course! The Chen Style has always been taught within the Chen family clan. However, this rule has since been relaxed somewhat, although the highest secrets of the art are still only imparted to direct kin. So, lucky for us, we do still get some martial application know-how as and when Teacher sees fit! Since young, Teacher Zhu has learnt the art under the 18th disciple, Chen Zhao Ku and Chen Zhao Pi, who were his uncles. Due to his love of the art, Master Zhu has won many gold medals in China, at the National and District levels, as well as in many international competitions. Together with his fellow disciples in the Chen village, he and another three have made a deep impression in the world of Taiji, and are known collectively as the 4 Golden Arhats or 4 Tigers of Chenjiagou Village. Teacher Zhu’s golden maxim to us is “Practice 10 sets everyday of Lao Jia Yi Lu, 5 in the morning and another 5 at night!” Mind you, 1 set is about 15 to 20 minutes on average. He has a long-standing reputation as a top, international Taiji instructor within the Taiji arena. He has taught students from Singapore, Malaysia, Japan, Korea, USA, Italy, Germany, and even Czechoslovakia. My personal opinion is that he has perfected his style of Taiji to a level of artistry. Extremely fluid and circular movements throughout characterize his style, and each routine is completed as if in one long, deep continuous flow. The one lesson that Zhu Tian Cai cherishes most from his master Chen Zhao Pi is that Taiji Quan (Tai Chi Chuan) is lively (“Ling Huo”). If you are accustomed to the fast Kung Fu pace, you wonder what is “lively” about Taiji. You have seen Taiji presentations during the “Masters Demonstration” at many Wushu championship meets or festivals. In contrast, the audience is always more delighted at the rapid-fire moves, the high-flying kicks and the low-to-the-ground stances of Wushu, from the sound of its applause. Yet, you are aware that Taiji Quan enjoys a high regard in the Chinese martial arts world. So you hang on to the recitation of the Taiji master’s lineage and legacy preceding the demonstration, look forward to a revelation of something about art. More than what you see in parks. This is only the obvious aspect, which is not surprising, as Chen Taiji is not practiced slowly for the sake of slowness. The slow-motion practice is a means to an end, to discern and to experience the motion in detail, body and mind. This method of training “softens” the body so that it becomes sensitive. When the practice pace is slow, you must not be tense (“Jiang”), and when it is fast, the movements must not be confused or scattered (“Luan” or “San”). You can then execute movements fast like Kung Fu moves without tenseness but with a relaxed body and a clear, sharp mind. Chen Taiji does recognize practice in speed and power. The “soft” practice is misleading, but is a way to build power (internal) or “hardness.” The Taiji movements appear soft, but they are not weak. The not so obvious aspect of this idea of liveliness is to be found in what resides in theTaiji motion. The basis to Chen Taiji motion is the “silk-reeling energy” (“Chan Si Jin”) that drives it. This energy is fundamental to Chen Taiji practice, and it is behind the spiraling and coiling motion that defines the character of this Taiji style. This energy expresses itself more and more as “Qi” develops, when the practitioner rids the body of tension and works to calm the mind. The motion then is driven by Qi, which is stirred by the mind-intent (“Yi”). In this way the coiling motion becomes lively, charged with silk-reeling energy. With this energy moving internally, Master Zhu’s form exudes power with “Peng Jin” as he flows from posture to posture, like water running in a brook. Without this internal energy the form will look dull and wooden. Without silk-reeling energy there is no Chen Taiji. Without Peng Jin there is no Taiji Quan. The least obvious aspect of “Ling Huo” deals with Taiji’s application, and this is what makes Taiji such an effective martial art. Because it is hidden from the naked eye, it is a source of mystery and wonderment. Can this slow motion Taiji practice stack up against the quick and powerful kicks and punches? To demonstrate this yi, Master Zhu throws a “Fajin” punch and the fist flies out like the crack of whip. He does more to show how he summons his body into action, by doing one Fajin after another, with his elbows, shoulders and hands. Each is as stunningly powerful as the last. Devastating though the power is, it is more important to note that this explosive release of collected internal energy from the body can be called upon in any situation as needed in a martial application. The premise of Taiji Quan’s application is that whatever the intended use of a form or posture may be, it is Ling Huo; that is, it is not restricted or “dead.” The coiling “Jin” has two orientations and three degrees of motion in space. Take the simplest point affecting a martial use – the distance between yourself and the opponent. The common upper rollback movement in the form, where the arms move in an upper arc, is intended to intercept an opponent’s attacking arm, deflecting and throwing him/her off. At a closer range, this intended use may not apply, but the internal energy can be directed to the elbow to strike out, or closer still, to the shoulder for a shoulder-fajin to damage. There is yet another category besides Fajin. There are many small subtle movements that require a short hidden burst of force, or “an jin” to execute in martial use. The liveliness of Nei Jin is at play here too. 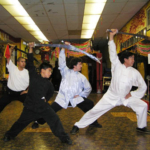 In Dec 1999, Master Zhu was in Los Angeles teaching a class, and arrived at the move called “Xiao Qin Da” (Small Grapple Counter), which is a combination of movements. Lao Chen, a student, asked him about the use of the move. This move has small and subtle movements that are not apparent. The master detailed the motions. Firstly, the small rotation of the wrist frees an attacker’s grappling hold (“Qinna”) on the arm. The attacker senses that he is losing his hold, and notices the defender’s advancing foot coming in to step on his shin. So he retreats. The defender follows, and steps into the opponent’s domain, with the arms pushing him off. He resists the push, but the move allows for this with an upper rollback and a counter offensive thrust. Thus Master Zhu expounded as he showed the intricacies of the movements. He then gestured to Lao Chen to assist in a demonstration. Lao Chen grabbed and held the master’s wrist. He was bigger and his grip was strong. Master Zhu proceeded to free the hold by a screw-like motion with the wrist, as he had done many times before. But instead of the sequence of advancing steps, as seen and explained earlier, the class was surprised to see Lao Chen flying off, knocking down a fellow student ten feet away. The class was stunned and awed at the same time. The students wanted to know what mysterious hidden power the master used. He replied that it was Lao Chen’s own force that threw him off. As he uttered those words, he was hearing almost the same words spoken by his own master in chiding a fellow student in the early training years in Chenjiagou (the Chen Village). Zhu Tian Cai was practicing push-hands with this student who was five years older than the average teenagers then, and so was bigger and stronger. Young Zhu had learned not to be intimidated by size and strength. His master had taught them to keep working on “Peng, Lu, Ji, An,” and that they were not to be discouraged if a physically stronger and bigger person prevailed, as it did not mean that the latter had better skill. The young students, heeding the Master’s words, would usually yield by backing away when this older student pushed hard at them. So it appeared that he was chasing the lanky kids around during the push-hand sessions. One day, this older student pushed hard at Zhu, as he always did before. Zhu found his ground this time. So instead of backing away, he stayed and absorbed the incoming force by a large rollback. Unfortunately, the charging student’s index finger was caught in Zhu’s hand and broke like a brittle twig. The pain was excruciating and the next day the finger swelled. He complained to the master that Zhu used force on him to break his finger. The master said it was his own physical force that caused it, and not little Zhu’s. As Master Zhu attempted to free his wrist from Lao Chen’s powerful grip, the latter pressed harder still. Master Zhu relaxed and reversed his coiling motion. His hand could “hear” that Lao Chen slipped, and instantly, he let out a shoulder Fajin striking him and sent him flying. The body’s sensitivity to “listen” to the opponent’s force, and to respond accordingly to the changes, is the third manifestation of the hidden liveliness inherent in the body’s Peng Jin. This hidden element of Ling Huo is paramount in the martial application of Taiji Quan. This very element is also the cause of amazement that continues to astound fans and Wushu aficionados alike, and feeds into the mystery of the art. 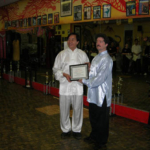 Master Zhu certified Shifu Marquez has 20th Generation Disciple.